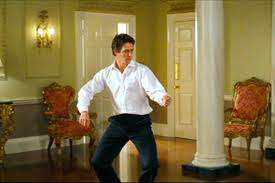 How funny is Hugh Grant dancing? Mr. Barros: Sell? Who said 'sell?' I'll pay him. OH and the part where Emma Thompson confronts her husband about his roving eye? I ALWAYS cry at that bit. But this is the part I was thinking of when I started to write this post. It's the intro. If you look for it, I've got a sneaking suspicion... love actually is all around. I remember this every day when I'm at school, picking up the kids in the afternoon. All these little kids come running out of their classrooms, and run full pelt at their parents, leaping into their arms, yelling "Mum!" or "Daddy!" and there are massive hugs and kisses and occasional clobberings with a lunchbox. You're right, love is everywhere. That is a great movie. I also love the movie Imagine Me & You. Ah -- I haven't seen that one, so I Googled it and I'll keep an eye out next time I'm in the video shop. Congratulations - you're a woot woot winner! can you email me through my blog with your postal address. Love Actually is my fave all time rom-com... but lately I have been obsessed with Forgetting Sarah Marshall.... as in I watched it three times in one weekend, including all the special features. Have you seen it? No, I haven't, Starfish! I'll check it out though. I love me a good chick-flick. My all-time fave movie. I can't count the amount of times in this movie I cry! Even hubby wells up. As far as movies and messages go, nothing compares for me! ah ya big old softy!